I don’t really want to wade into this discussion too strongly… there are a number of great resources out there documenting the utility of social media in science and science communication (examples here, here, here, and here). But nonetheless, the use of social media by scientists is still a contentious topic. Personally I use Twitter extensively for work and have found it to be an invaluable tool that has changed the way I do science. But what I want to talk about today is an example of how that tool helped in the classroom, and the student reaction to it. Bit of background; Katie Dahlhausen is a graduate student in our lab who is working on the koala microbiome. This last quarter, she, Ashley Vater, and I co-instructed a research class for transfer students where we isolated bacteria from koala feces, identified them, and measured their antibiotic resistance. On the very last day of class, one student approached us with a strange pattern on her plate and asked “what does that mean?”. None of us had any idea, or really any kind of plausible hypothesis… I’d not done a lot of antibiotic disc work, but I’d certainly never seen that. In the pre social media world, the story ends there. It’s possible we could have gone back to the lab and researched the topic, perhaps asked a few experts and gotten back to the students… except it was the last day of class and we would never see the students again. Not to mention the time involved. 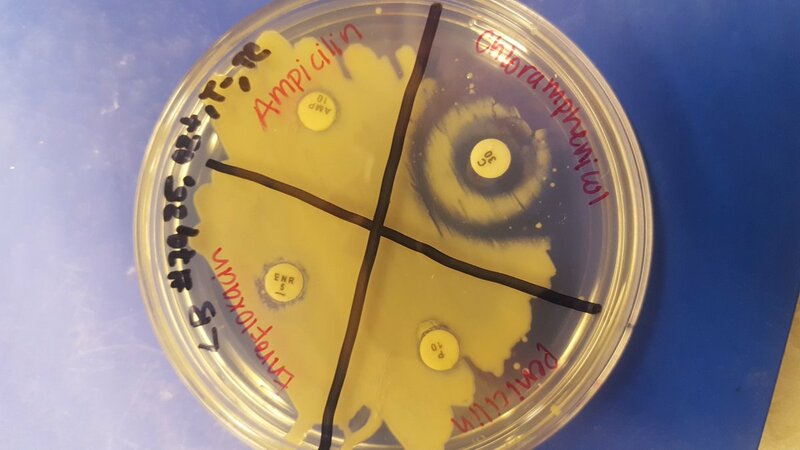 However, in the social media world, Katie tweeted the picture asking “Can anyone explain this bullseye pattern on antibiotic resistance screen?”. While the class moved onto discussing their final assignment, the responses started pouring in. Within 10 minutes we had several thoughts and by the time an hour had passed we had 2 references, a couple figures, multiple hypotheses/ideas/experiments from researchers in at least 6 countries. Fortunately the classroom had a digital projector, so we projected the Twitter discussion up on the screen and went through the various hypotheses/ideas and discussed each one briefly with the students. I am positive that the students learned more science in that discussion than in the entire rest of the class period. In addition, they were amazed at the speed, depth, and quality of the responses. One professor even retweeted to his own class, offering a cookie to any student who came up with a plausible hypothesis. We could see that the idea of some other class of students, across the country, thinking about our humble agar plate at the front of the room had an impact on the students. They were impressed and they were engaged. Compared to the “Wow, that’s really interesting… I have no idea what could make that pattern” that we would have otherwise given, I think social media scored a clear win here. I’ve included a Storify of part of the discussion here… not all of it came through since it branched off into multiple threads.